Anna Duggar is expecting her fourth child, a girl, in three months. (Alyssa Bates Webster is due in three days, and Erin Bates Paine is due in two months.) Josh and Anna joined the Duggars in Arkansas for Easter. I am so excited for these Godly Moms who are expecting children. I am sure that many of the followers of your blogs are praying for them! I am concerned for Jill but know that she is in the Lord's Hands! Thank you for the updates! Well I hope Anna's little one comes on her due date. I don't know if I could stand waiting for another baby being overdue. Praying for patience for Jill and Alyssa, as well as safe and fast deliveries. :) Enjoy your sleep ladies. You are going to need it! Your precious little ones will be here soon! From this angle, Anna doesn't seem very big for how far along she is.....or maybe I'm just used to seeing Jill's BIG baby bump. 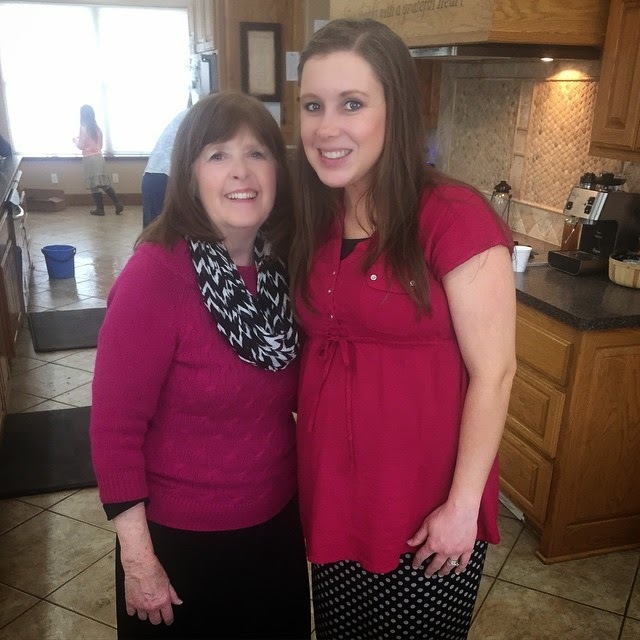 Fantastic picture of Grandma Duggar and Anna. Look amazing as always. God Bless ya"ll! Good Luck to you all on your new little additions to the family! God has truly blessed you all! I love your show !!! Hopefully Jill is in the care of a Dr. making sure there are no complications with this delivery. 2 weeks is a long past due time with baby growing possibly beyond normal delivery options. Wishing with all the happiness with all the new babies with their two families. Following along for the new seasons of life is interesting but the original Duggar information just about everyday life in their big family was what originally caught on. Now there is not so much about that on the blog. Hope all is going well, so happy to here all the new little one that are comming. God is blessing to all. Does Anna ever get to visit her family? 42 weeks? That's going to be a huge baby! Good luck Jill and Derick! Anna, you look radiant as ever. Where has Jim the camera man been hiding? Very exciting!!! So many new babies! I'd like to hear more about Jill's delivery. Fyi. JILL HAD HER BABY LAST NIGHT!!!!!!!!! BABY ISRAEL David was born at 11:49 last night April 6th. He weighs 9 pounds 10 ounces. Checkout the people magazine article for PHOTOS and more info!!!!!! Love all the duggar. Congrats JILL!!!!!!!!!!!!! Baby Dilly is here. His name is Israel David and it was no homebirth. I thought so because she was really going far over her due date. Which can be very dangerous, apparently they've seen that danger and went to the hospital. All the best now and a healthy recovery for Jill. I love Josh and Anna ;-) they have been an inspiration to me as a young mom as well. People just posted a birth announcement and beautiful photo. Congratulation to the new parents. Hope mom and baby are doing well. JILL dillard had aby israel yesterday! welcome israel david dillard!! I didn't know Anna was so tall. People magazine released name time weight and date of birth of hills baby!!! Did she get to stay for the birth of Ireal? Looking beautiful as ever....Grandma and Anna~! Waiting for baby number 4~! ill be praying for all of you ! You're Beautiful, Anna! I hope the remaining 3 months are easy for you and you get to just enjoy your pregnancy! I love seeing these updates. I hope you all got to see Baby Israel before going home. She is beautiful from inside out! My baby bump is probably the same size as yours... I am due July 8th!!! So excited! The rag mags better stock up on ink. So much world-breaking news awaits. Bates and Duggar babies are being born. I love seeing the family but it seems like the girls are on more than the boys! When I see their pictures I don't even recognize them from the program. Do some of them like being in front of the camera more than others? Also what happened to Jim Bob's sister? So nice to see Christian standards and young people not afraid to stand up for what they believe. Anna looks great for being 7 months along. Anna has such beautiful babies! She and Josh are so so blessed. I just love this little family. They are precious! Anna looks like she has lost weight! I can't wait to see a Dugger and and Bates get married! Congratulations Anna and Josh on your 4th child. Can't wait to meet her. Congratulations Anna and Josh on your 4th child. I can't wait to meet her. CONGRATULATION ANNA AND JOSHUA. GOD BIG BLESS YOU TWO WITH 4 TH CHILD. GOD BLESS ALL FAMILIES OF DUGGARS. I love Anna, she is one of my favorites. awe another girl making it even. congrats and best wishes. So glad to see Anna, I have missed seeing her lately. She looks great and so does Grandma Mary!! That is a great color on both of you. I hope Anna can keep us posted, I am anxious to hear how things go with the new one. Can't wait to hear what her name will be. All Anna's children are just adorable. Anna, if your previous 3 labors and deliveries are an example to you, get thee to a hospital quickly to deliver there...why suffer needlessly and put yourself and/or the baby at any risk? Partake of the good medical care available to us in this day and age...they were developed for a reason. I agree with the quality medical care available at hospitals if it is needed in the event of an emergency with the baby. However there is nothing wrong with having a natural child birth. These days too many women are afraid of experiencing a little pain while giving birth to their babies. Actually it is called natural child birth because it is as God intended women to bring forth children. I had both my children naturally and my daughter has done the same with her children. Women today just need to toughen up, I've experienced a lot of pain in my lifetime and childbirth is fairly low on that scale, besides the fact that once you see that little face looking up at you the pain is all but completely forgotten. Women should give it a chance, you can still be in a hospital as I was and as my daughter was, but you don't need to rush in there so you can get an epidural and numb yourself from what you're meant to feel. Congratulations Anna and Josh!! I cant wait to meet her! I love watching how God is blessing the Duggar family! Was she able to stay for the birth? Is that the house the Josh is rumored to have bought in Arkansas? Congratulations on all the little ones. God blessed me with 2 and he took them to live with him in heaven. The Lord did bless me with 3 beautiful adopted children and they are my world but it would have been nice to have raised my gifts from God. Anna, please, please, please, have this baby in a hospital. Yes, things will likely go fine even at home, but you never know. It is best to be near a medical facility in case things go bad. I was really concerned for you with Michael. Very happy for you Josh and Anna..you look radiant .Grandma Duggar is just gorgeous never aging! I hope that in the next couple months will go smoothly, and I can't wait to see her!!! I hope you've been reading Jill's posts, and I hope you will start to use Lavender Tea too!!! I think your great, and I everything will go very WELL WITH YOU!!!!!!! Any thought to what they are going to name her?